Self-guided, inquiry-based exercises using open-ended questions allow students to explore a scientifically significant question in their own way focusing on their interests. 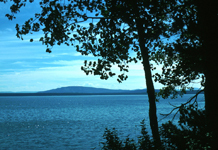 In this section we have provided several broad, open-ended questions that are important to understanding an aspect of the Yellowstone Geoecosystem. For each compelling question suggested, exploration pathways are proposed to guide further questioning and discovery of information. Is Yellowstone volcanism caused by a deep-seated mantle plume? This is a resource collection related to the possible existence of a deep mantle plume beneath Yellowstone. Most textbooks show a mantle plume rooted in the aesthenosphere with the continental lithosphere passively riding over the top. Is this really true? What does the latest science say about this question? Check out the latest geological, geochemical, and geophysical evidence! Is there a present volcanic hazard? This is a self-guided exercise designed primarily for students in introductory Earth science courses. The aim is to provide a basic understanding of the volcanic hazards of the Yellowstone Geoecosystem. What are the compositions of volcanic rocks from the Yellowstone Plateau Volcanic Field, and what do they imply about petrologic processes? This is a self-guided exercise for undergraduate petrology students, which uses whole-rock geochemical data from the Yellowstone and Crater Lake calderas to explore diverse petrologic processes whereby caldera-forming volcanoes are constructed. Should geothermal energy resources around Yellowstone Park be developed? This self-guided student activity allows students to explore a complex geologic and environmental issue. Given the extremely high geothermal gradient in the Yellowstone system, why not try to harness geothermal energy as a resource? Would this activity present a direct risk to geothermal activity in the park? What's the scientific evidence, and what policies and laws have been enacted to protect the park's geothermal features? 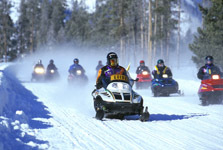 Snowmobiles in Yellowstone National Park: An American Right, or Wrong? Snowmobiling is an integral part of the winter tourism season in and around YNP, with huge economic benefits to surrounding communities. Opponents of snowmobiling claim the machines are loud, emit high levels of atmospheric pollutants, and disrupt habitat and animal migration routes. What does scientific research have to say about this issue; how does this translate to public policy? 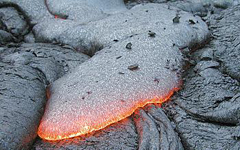 Is volcanism caused by a deep-seated mantle plume? Should geothermal energy be developed?